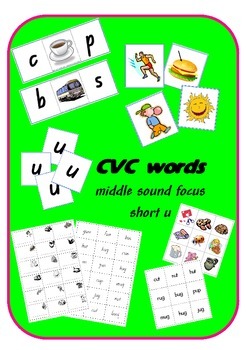 This resource provides practice with 18 CVC words for each of the short vowel sounds - a, e, i, o, u - with the middle sound as the focus. 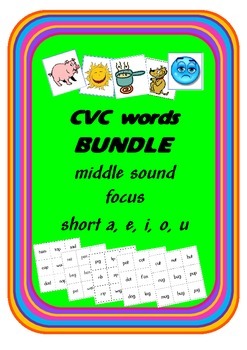 It is a bundle of the 5 short vowel sound resources available separately on my store. Buy all 5 together here and save more than 25% Please download the preview to see what you get. Word cards have the picture in the middle place and letter a cards to place on top to complete the word. 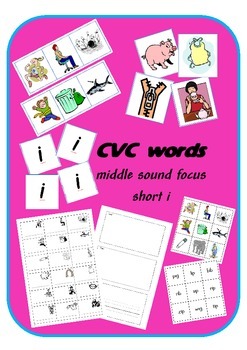 There are also picture cards for matching with words, bingo cards with words or pictures, Read - Make - Write pages to use to practice the words and assessment pages. 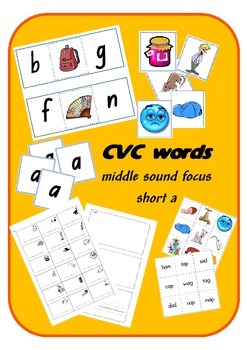 Suitable for use in early years literacy centres or for older additional needs students. Check out the preview for a closer look. If you like this product, please rate it and leave me feedback! If you have any problems with it, post a message in the questions area to let me know.